It's smart to have some growth and momentum stocks in your retirement account. Right now there are few better examples of both than Micron Technology. If you're investing for retirement, chances are your focus is slanted in favor of stocks that provide value and income. But ignoring growth stocks, especially in this market environment, is a huge mistake. One of the most important, yet least practiced tenants of retirement investing is that the stocks that make good investments for retirement generally aren't all that different than the stocks that make good investments during the rest of your life. While your risk tolerance may change over time, that's more a factor in position sizing than in stock selection. In other words, it's smart to have some growth and momentum stocks in your retirement account. 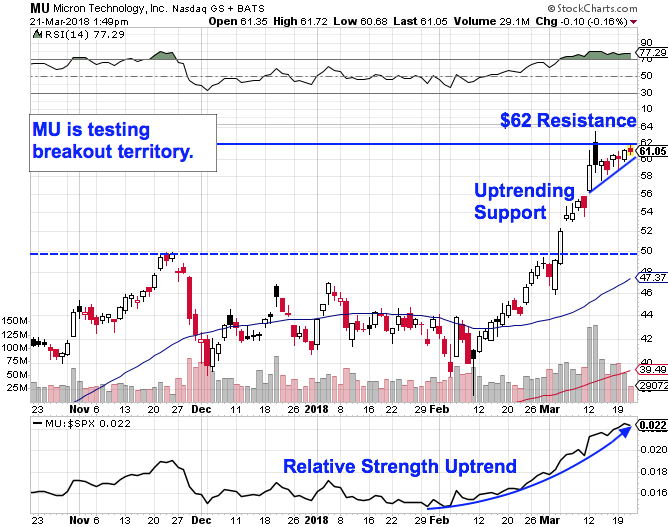 And when it comes to growth and momentum stocks worth owning right now, there are few better examples of both than Micron Technology Inc. (MU - Get Report) . Micron is teetering on the verge of breakout territory this spring. To figure out how to trade it from here, we're turning to the chart for a technical look. Micron made it through February's broad market correction relatively unscathed. While the rest of the broad market plunged, Micron managed to hold onto prior support down at the $40 level. And while shares didn't drop alongside the rest of the broad market, they did participate in the rebound rally that followed. Now, after surging off of the $40 level, Micron looks ready to hand investors another breakout move. The pattern in play is an ascending triangle pattern, a bullish continuation setup that's formed by horizontal resistance above shares up at $62, and uptrending support to the downside. Simply put, as Micron bounces in between those two technically important price levels, shares have been getting squeezed closer and closer to a breakout through their $62 price ceiling. When that happens, we've got a brand new buy signal in Micron. Relative strength, the side indicator down at the bottom of Micron's chart, adds some extra confidence to the upside signal in this stock -- Micron's relative strength has been hanging onto an uptrend of its own since February, signaling that this stock is continuing to systematically outperform the rest of the broad market right now. If you're a retirement investor weighing a Micron position right now, risk management matters. After all, tech giant Facebook (FB - Get Report) just provided us with a pretty poignant example this week of the dangers of outsized positions in a single growth stock. That said, as part of a larger portfolio of positions, a stake in Micron makes sense for retirement investors looking to take advantage of growth and momentum in the months ahead. A breakout above $62 is the next big buy signal in Micron.